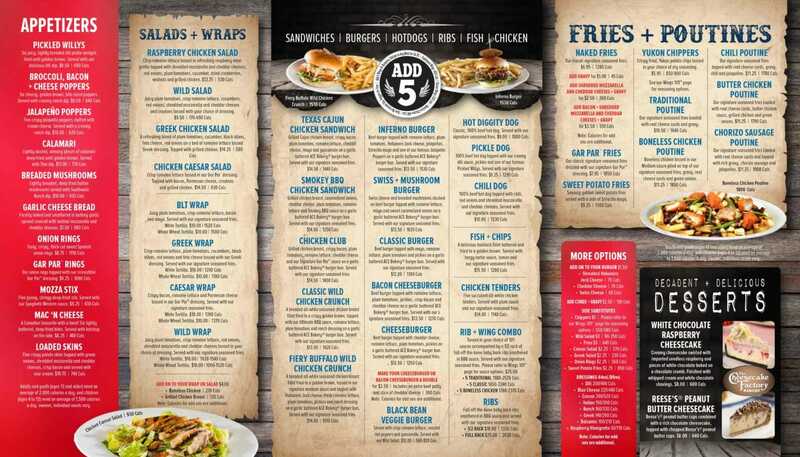 View Wild Wing Canada Menu for 2019, and Burger Nutrition Facts & Calories. 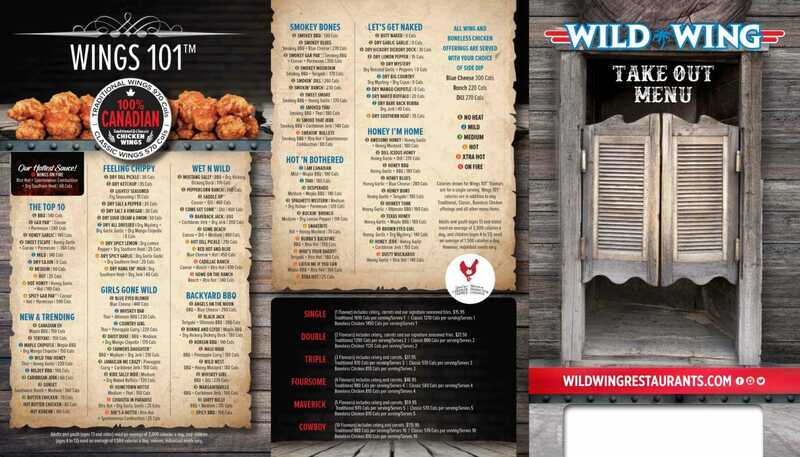 Don’t miss the Wild Wing Restaurant specials, Lunch offers and the latest promotions & discounts. – $9 Lunch – The $9 Lunch is available with the purchase of a beverage, Monday to Friday from Open until 3pm. All specials are dine-in only, plus tax. At participating restaurants. – Mondays – $12 Boneless Chicken 900-1570 Cals. – Tuesdays – 1/2 Price Wings 1280-2830 Cals per serving. With the purchase of a beverage. Single orders of wings only. – Wednesdays – $10 Burger 560-1770 Cals. From 4pm to closing. With the purchase of a beverage. – Thursdays – $18.50 Wings 1280-2830 Cals. – Sundays – 1/2 Price Flatbreads 430-610 Cals. With the purchase of a beverage. The menu includes wings 101, appetizers, flatbreads, salads, wild wraps, sandwiches, hot dogs, burgers, ribs, chicken, fish, fries, poutine, desserts, and kids menu.